Nutritional Supplement: DE is loaded with silica—a vital mineral that is very hard to get otherwise. Silica lowers blood pressure, destroys bad fats, makes hair and nails strong, keeps joints healthy, regulates the digestive tract and bowel, and has so many more important functions. DE is a great internal cleanser. Its sharp microscopic pieces of ancient diatoms scrape the intestinal wall, cleaning as they go and making your intestine more capable of absorbing the vital vitamins and minerals that your body needs. Natural Pesticide: This is the reason we carry it in the first place. Storing grains in DE, rather than using an oxy absorber, ensures that your grains will sprout when you open your bucket! DE is a natural pesticide and can be used in the garden, on trees, and to contain/eliminate ant infestations or the presence of other bugs in your home. It’s food grade, so it is harmless to us human beings (in fact it’s very good for us) but it kills bugs by dehydrating them from the inside out. Thus bugs cannot become immune to DE, and it works every time! Pets and Animals: DE is used to de-worm pets and animals and will work to eliminate parasites in humans as well. How does Redmond Clay work? Bentonite clay has a negative electrical charge, attracting positively charged toxins. The formation of bentonite resembles tiny business-card shapes, with negatively charged wide surfaces and positively charged edges, providing a powerful drawing effect. As most toxins are positively charged, clay naturally rids the body of toxins as it pulls and holds the toxins into its core. How do people use Redmond Clay? Throughout history, people have used bentonite clay when suffering from occasional diarrhea, constipation, heartburn, stomachache, acid indigestion, acid reflux, and other severe digestive problems. Clay has also been mixed into a poultice and applied to cuts, bruises, insect bites, bee stings, boils, rashes, acne, burns, severe dry skin, and achy joints. Redmond Clay™ remains as pure today as it was when the Fremont Indians discovered its uses many years ago. 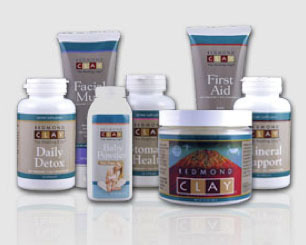 Discover for yourself the healing benefits of Redmond Clay. Many people consider it their first-aid kit in a bottle.